Pinterest is a pinboard-style photo sharing website that allows users to create and manage theme-based image collections such as events, interests, hobbies, and more. Users can browse other pinboards for inspiration, ‘re-pin’ images to their own collections or ‘like’ photos. It’s the one of the fastest growing social networks online,Now,Pinterest is the third-largest such network behind only Facebook and Twitter.There is no doubt pinterest is a nice traffic source for internet marketing. Nowadays,Pinterest marketing have become more and more popular.You can find lots of Pinterest Backlinks Service,Pinterest Repin and Pinterest Likes service.Yep,you just go to fiverr,you can easily find how popular it is.Why it’s so hot? For Pinterest not only can send you more real human visitors,but also it’s good for SEO,social signal now is key factor for your keywords ranking on search engine.That’s really can help you to get better page ranking. 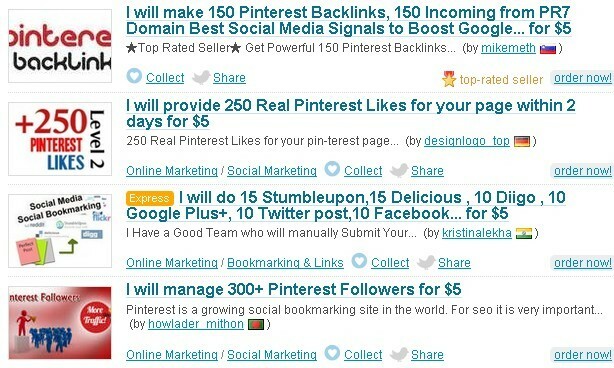 How can you get more Pinterest followers,Pinterest Repin and Pinterest Likes? The blackhat way is use multile pinterest accounts.If you want to creat more than 10 accounts that you should use proxies.Here is my experience on private proxies for Pinterest. I’m created about 100 accounts with a total of 25 proxies.So that’s 4 account per proxy.Of course,If you have lots of proxies,I recommend creating only 1 account per IP address.Those 100 accounts can drive 50-100 clicks a day on Pinterest to my niche site.If you can’t afford private proxies,you can use shared proxies instead. Now after created accounts you can uploade a Pin without need a proxy at all.Pinterest asks me every now and then to fill a captcha when I log in to an account straight after closing another, but none of my accounts have been deactivated. So I can to continue use those account get more traffic form Pinterest.BTW,if you have lots of Pinteres accounts,you also can creat a website for providing Pinterest Followers, Pinterest Repin and Pinterest Likes.